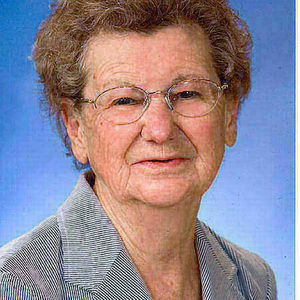 Hattie A. Lenzmeier, 91, Wahpeton, ND passed away on Saturday, December 22, 2012 at St. Catherine's Living Center, Wahpeton. A Family Celebration of Life will be held Friday, December 28, 2:00 PM at Vertin-Munson Funeral Home, Wahpeton. There will be sharing of memories with Hattie's family one hour prior to the service. Interment will later be held at Fairview Memorial Gardens, Wahpeton. Hattie Arlene Lenzmeier was born July 24, 1921, the daughter of George and Julia (Johnson) Wold in Wahpeton, ND. . She grew up on a farm near Dwight, ND, graduated from Wahpeton High School in 1938 and Interstate Business College. On February 2, 1945 Hattie married Harold "Sport" Lenzmeier. The couple resided in Wahpeton where they raised their six children. Hattie worked at St. Francis Hospital, Breckenridge, MN for over 20 years, retiring in 1989. "Sport" passed away August 2, 1993. Hattie continued to live in Wahpeton. Hattie was compassionate, caring, kind, helpful positive, polite and thoughtful. She enjoyed dancing and in later years she relaxed by sitting on the front porch swing, watching the wind rush through trees as it took the winkles out of the American Flag at the school across the street, along with a good cup of coffee and a peppermint. Hattie is survived by her six children, Debi (Richard) Rehm, Nashville, Tn., Dee (Bob) Comstock, Wahpeton, ND, Craig (Georgia) Lenzmeier, McCall, Id., Brian (Trudy) Lenzmeier, Rugby, ND, Julie (Nick) Gludt, West Fargo, ND, and Lori (Dan) Miller, Wahpeton, ND. She is also survived by 13 grandchildren; Jason (Jamie) Rehm, Chris (Kris) Rehm, Bobbie (Willy) Marvin, Michael (Kristen) Comstock, Adam (Rheanna) Lenzmeier, Brian Lenzmeier, Joey Lenzmeier, Breann Lenzmeier, Tyler Gludt, Ali Gludt , Alex Miller, Jack Miller, Hattie Miller, and 11 1/2 great grand children. Hattie is preceded in death by her husband, Harold, infant son, Harold Cleve, her siblings, Edythe, Ruby, Fern, Earl and Bud. In lieu of flowers, the family suggests you perform an act of kindness in Hattie's honor. Help make this word a better place for everyone. The beautiful and interactive Eternal Tribute tells Hattie's life story the way it deserves to be told in words, pictures and video. My prayers are with you as you say good-bye to your dear mother. I have heard such great stories about what an amazing and loving woman she was. I see those qualities in her children, as I have watched them take such loving care of her in her final months of life. Continue to carry on your mom's legacy, in the kind deeds you all do on a daily basis. To all of Hattie's family I extend my deepest sympathies for the loss of such a wonderful woman! I was blessed to work with Hattie as a night supervisor. She was cheerful, more than knowledgable and always making sure I was safe no matter where duty called in the hospital. I was sad when she retired and knew those shoes would be hard to fill - Hattie was such a gem and will be missed by many. You are all in my thoughts and prayers. I worked as a part time night supervisor at SFMC and working with Hattie was always a joy. She was knowledgeable and competent and I valued her abilities! My sympathies to the family on your loss. Hattie was raised near our home near Dwight.The Wold family were the finest neighbors one could wish for.Hattie was a bit older then me. We would visit back and forth, Her Brother and I were good friends, Brother Earl become my bro.-in-law. Good memories of Hattie and the Wold family. Sincere condolences to the Lenzmeier family on the loss of your loved one. Your family was always respected and appreciated as a support system to kids and the community. May your many great memories of Hattie bring smiles.